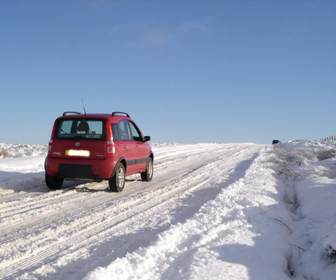 Mountain driving can be challenging, due to the frequently changing weather conditions and elevated concentration required of the driver on mountain roads. You have to learn a number of advanced driving skills before you get up there and novice drivers are strongly discouraged from driving in the mountains until they gain some experience in a safer training environment. On the other hand, driving in the mountains can be an immensely joyous experience, with a great scenery surrounding the driver every mile of the way. Following these mountain driving safely tips that will keep you out of trouble whenever you are up there! It is important that you conduct a pre-drive check up and make sure your vehicle is in good condition before you set out on the road. Your vehicle's performance usually diminishes in the mountains, so you have to make sure all systems are functioning well before you get up there. Check your brakes. Make sure your brakes are working before you get to those long descents. 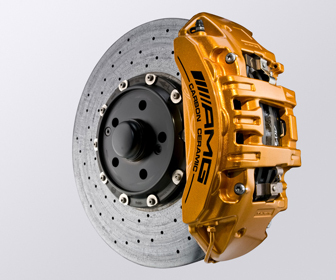 Your brakes will be doing a lot of work in the mountains and you need to know they are up to the task. If you observe the recommended service intervals for your vehicle, you should be covered, but it never hurts to check one more time. Examine the tires. 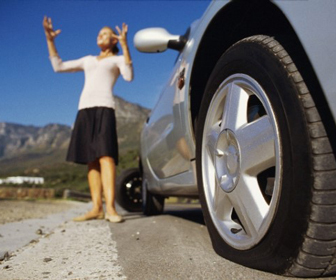 Your tires must be inflated to the recommended pressure and have enough tread on them. Look for bumps and cuts on all wheels and make sure you have a spare. The tires will heat up during long descents and you may experience a blowout. If you notice anything suspicious about one of the tires, have it replaced before you set off. If you have a blowout while driving in the mountains, follow these steps to recover from a tire blowout safely. Verify the vehicle's coolant level. Your engine will be working at high revs most of the time while driving in the mountains, this produces excess heat and your cooling system will be the one to take the punch. If you had any troubles with the engine cooling system previously, have it checked out. 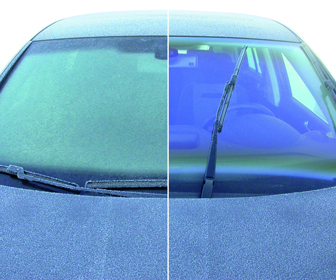 Clean your windscreen to avoid glare, make sure the headlights are clean and operational, verify that the wipers are working. This should be part of your every day pre-drive check up routine. 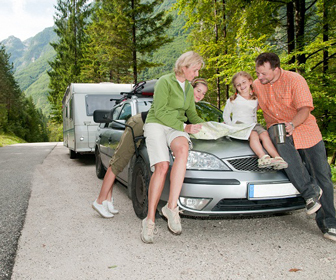 The rules of mountain driving are not that different from the rules you have to observe while driving anywhere else, however there are a few additional laws that you need to be aware of. 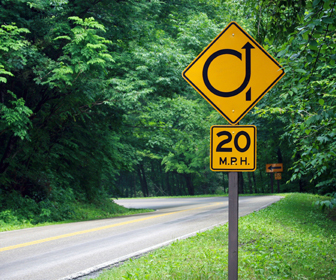 Whenever two vehicles meet on a steep one lane mountain road, the vehicle traveling downhill must yield to the vehicle traveling uphill by backing up until the vehicle traveling uphill can safely pass. The reason behind this is that the vehicle facing downhill has the greater amount of control when backing up. When you are traveling downhill and the road before you narrows, stop and yield to any vehicles traveling in the opposite direction BEFORE you reach the narrow space so you will not have to back up. 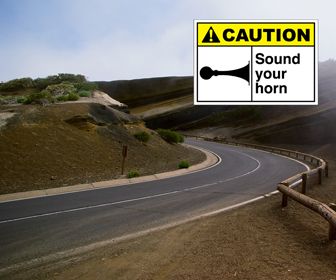 Some states require that you use your horn where you cannot see at least 200 feet ahead of your vehicle and this applies to mountain driving too. If there is a sharp curve ahead and you cannot see what's on the other side of the curve, give at least one sharp blast. Remember when it is appropriate to use the horn. Have your headlights on when you are driving on mountain roads. A number of states, such as California, explicitly require for you to have your headlights on when driving in the mountains, while it is only a recommendation for others. Either way, there will be no harm from having the headlights on and this may help you avoid a head-on collision. Make sure you use your low-beam headlights. Watch your speed. If there is one thing to remember about mountain driving, this is it: do not speed on mountain roads, travel at or below the recommended speed, depending on road conditions. Mountain driving places a lot of strain on your vehicle's braking system and its performance diminishes as your brake pads are heating up. When you are traveling downhill, you need significantly more braking power to stop the vehicle compared to traveling on even ground and it is easy to underestimate the stopping distance. Furthermore, at high altitudes, the road may be covered in ice even during summer, something most drivers do not expect. Check traffic behind you through the mirrors while traveling downhill. Vehicles build up speed moving down a steep grade, if you see a large vehicle or a truck approaching you too fast, try to move over to the right and give them enough space to pass in case their brakes are failing. When you are parking in the mountains, observe the rules for parking on hills: turn your wheels towards the center of the road only if you are parking uphill and there is a curb. 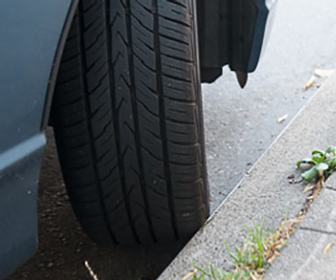 Turn the wheels towards the right side of the road when you are parked uphill or downhill and there is no curb and when you are parked downhill and there is a curb present. Use engine braking. When traveling downhill, you can use engine braking to slow the vehicle and prevent your brakes from overheating and fading. 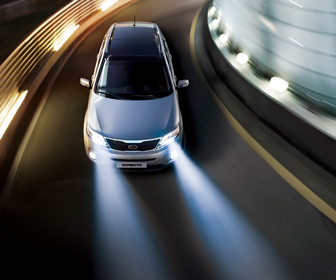 Engine braking involves shifting into a lower gear and allowing the engine to battle that gravity. 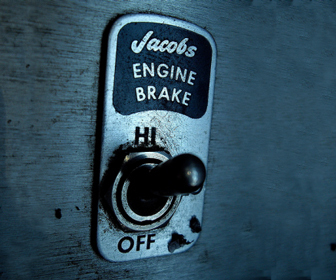 Despite what many novice drivers think, engine braking is not only for vehicles with manual transmission, most automatic transmissions have low gears to. Depending on your vehicle and the speed you are traveling at, you may have to use 2nd, 3rd or L gear to slow the vehicle. Passing. 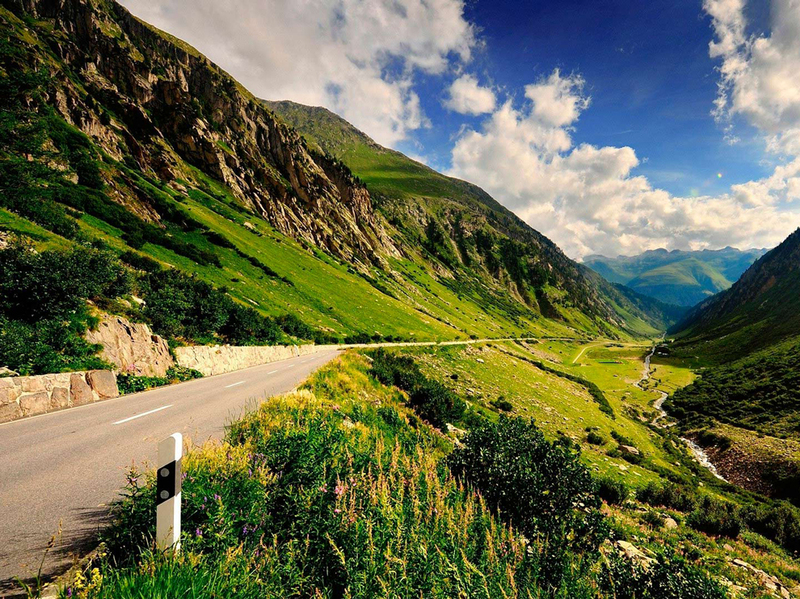 Passing in the mountains will be forbidden in most places, since mountain roads consist of a large number of curves and you cannot see far enough to make a pass safely. 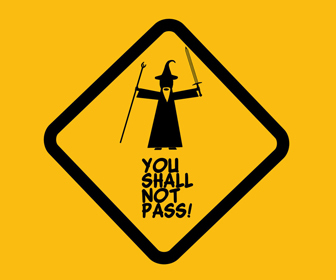 When you are in a place where passing is legal, remember that passing in the mountains is a little more tricky than doing so on even grounds. Your vehicle's performance diminishes at high altitudes and you will need more horse powers to pass when you are traveling uphill. Considering these things, always allow yourself more space when passing in the mountains. Take a break. Mountain driving is more stressful and requires a lot more concentration than regular driving, so you are likely to get tired. Take frequent breaks and rest as much as possible, a fatigued driver is a bad driver. If you find yourself going through the mountains in winter, make sure to follow the steps to safe winter driving.